Known as the Mighty Nam, this trip is the introduction to tripping for many of our campers. 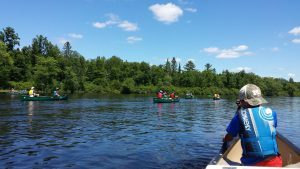 Campers who just completed 3rd and 4th grade will paddle the Namekagon River. The trip is a two day/one night trip, designed to expose our youngest age groups to the fun of wilderness trips. As with all of our trips, the Nam is age appropriate as the water moves at a smooth pace and any rapids are easy for our campers to handle. The river’s conditions allow campers to get practice paddling and guiding their canoes. This trip helps build a good foundation for future trips, both helping campers gain paddling skills as well as serving as a confidence builder. The Namekagon River is approximately 30 minutes from camp, depending on what stretch of river the campers paddle. Groups will camp at one of many campsites along the river that have water pumps and pit toilets. Campers take breaks from paddling to swim in the water, float down the river in their PFDs, play games with their counselors, and spot incredible wildlife. After a dinner of pita pizzas and s’mores, campers call it a night before waking up and finishing up their trip.